Found this massive mural while walking around downtown. Zio Ziegler has been previously featured here. He is an incredibly prolific artist with, what seems to me, a feverish mind. I could not find an official name for the mural. What would you call it? The content of this mural is so complex, it's hard to take it in. And the sheer scale of his murals is quite impressive. This one is on a wall of the Howden building, previously shown here. I think the pattern behind the figures is a nod to the building's original tile business. 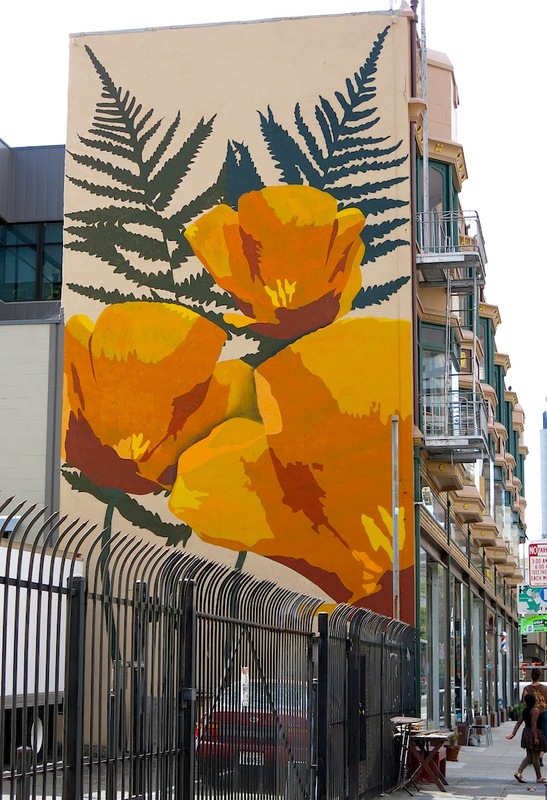 Our state flower, the California Poppy, is proudly displayed on a downtown building. It's painted by Pancho Peskador who frequently paints with the Community Rejuvenation Project, which is responsible for many of the murals in Oakland. I appreciate the mural's strong graphic qualities with its bold lines and colors. This mural captures the silky, glowing texture of our poppy. I totally get the idea of good vs. evil. I'm just not sure what a flying VW bus has to do with it. Spotted in Uptown. The artist is No One. These Ninja troops are an extension of last week's posted mural. But they seem so different in tenor, that they feel like separate works. Again, I couldn't discern an artist's signature, although the writing on the nearest weapon strap may be a big clue. Found on International Blvd. in East Oakland.